It's official -- Riptide GP 2 is in development! Perceptive fans noticed the splash screen and icon for the sequel in Jen-Hsun's NVIDIA CES keynote on Sunday night. Reports are that the game is playable on the show floor in the NVIDIA booth, running on NVIDIA's blazing fast new Tegra 4 mobile superchip! Riptide GP 2 will deliver all the fast action, incredible physics, and polished visuals of the first game -- and then some! The new game delivers even better quality graphics, including better splashes and wakes, more detailed water, and realtime lighting and shadows (on supported platforms). It will be available for multiple platforms, and includes special enhancements for Tegra 4 devices like the new Shield gaming platform. In addition there's a new career mode, hydro jet customization and upgrades, and tons of new content! 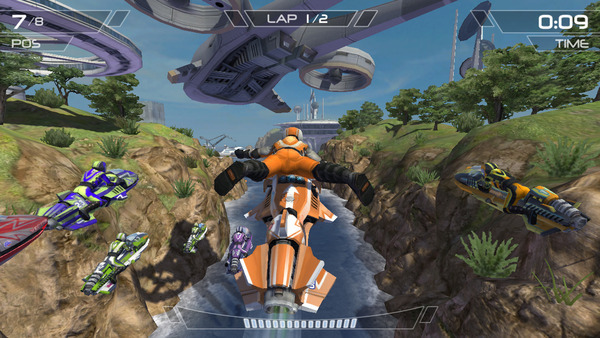 Riptide GP 2 is coming to Android and iOS, and is slated for a release in early Summer 2013. Stay tuned here and in our other social channels for more updates!